Conveniently located 4 minutes directly South of Starved Rock State Park on Route 178, the Brightwood Inn is nestled on 14 acres within the confines of Matthiessen State Park. Our Starved Rock bed and breakfast will provide you with a romantic, peaceful and luxurious stay amid the beauty of nature. Relax in your hot tub, read a book near your fireplace in one of our fluffy robes or stroll the outside gardens of this luxurious Country Inn. A full hot and homemade complimentary breakfast comes with your room each morning. There are many outside activities in the area such as hiking the state park trails, canoeing on the Fox river, horseback riding, sky diving, bicycling the I&M Canal towpath, white water rafting on the Vermillion river, shopping in the nearby towns and golfing. Winter activities include cross country skiing, Bald Eagle watching, viewing the beautiful frozen waterfalls of the state parks or just snuggling. 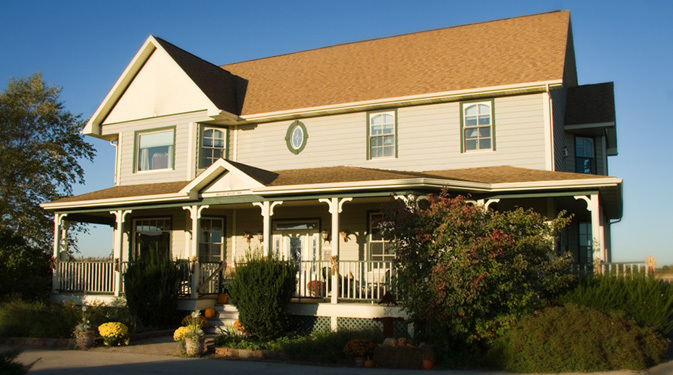 Celebrate your honeymoon, anniversary or birthday in our Romantic Country Inn. Free wi-fi is available throughout our Starved Rock bed and breakfast. All rooms feature beautiful accommodations plus satellite flat screen TV, DVD player with a full DVD library, seasonal fireplace and private bath. Six rooms have large, two-person hot tub jacuzzis and three have private balconies.